It seems that anemia is a pretty common problem in our society. Most women, and some men, I meet have told me that they are iron deficient or are about to go to the doctor to get tested and its pretty common practice to be popping iron supplements. I have never suffered from low iron but my sister has struggled with it most of her life and has been on iron tablets since she was a teenager and as I am on a mission to transform the health of this nation I figured I will start at home! So this has led me to research different natural remedies and root causes of why it is such a prevalent problem. Now as I have research anemia and iron deficiency is a pretty big subject so below is just a snap shot of what I have been gleaning from all my text books and my personal opinion, so always remember to chat to your doctors before making any changes . So today I am going to share with you some of the natural treatments I have been learning about. My sister is beginning to implement these changes now, and some others, so hopefully in a few months time we can give you a progress report and share how much better she is! (Here is one of my sisters recipes here in case your nosey of what she is like). Anemia basically is a term used to describe a low iron content in the blood. Our blood is made up of platelets, haemoglobin, plasma and red blood cells (plus more) and it is our red blood cells that carry the oxygen round and deliver it to the rest of our body. Haemoglobin is a protein found in red blood cell that is iron rich and give blood its red colour. If your body isn’t getting enough iron it will use up the bodies store of iron and then eventually not produce as much haemoglobin cells. Less haemoglobin mean less oxygen round the body meaning you will be easily fatigued, body can heal and repair as effectively as it would, pale skin, brittle nails, headaches, dizziness or shortness of breath. It can also lead to restless leg syndrome, frequent infections and more severe symptoms. There are many causes for low iron, internal bleeding, lacking on iron intake, unbalanced gut flora, stress, lack of good nutrition, menstruating and more. 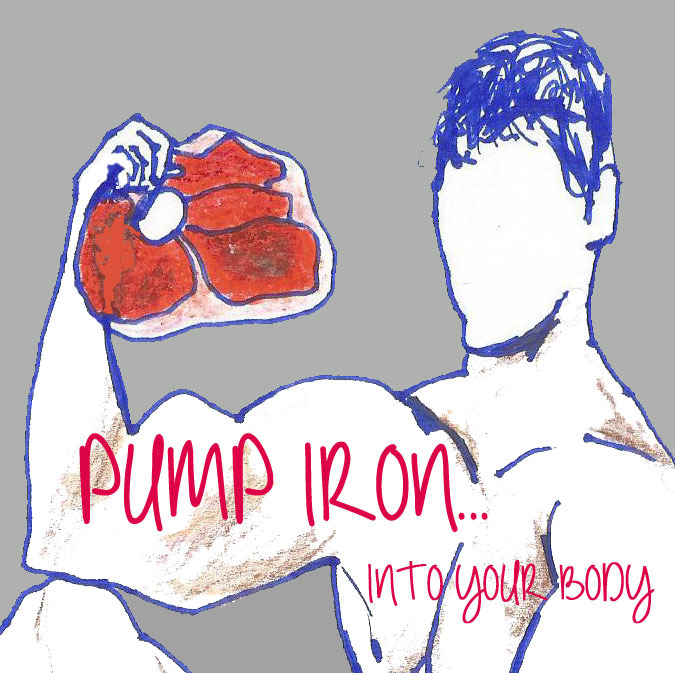 Today I am mainly going to look at the most common iron deficient cause – were you body is basically not receiving enough iron or not able to absorb the iron given it. Non meat foods that are high in iron are pumpkin seeds, molasses, lentils, quinoa, kidney beans, chickpea and other beans, cooked spinach, cashews and raisins. So make sure each day you are eating a combination of meat/fish and vegetable and pulses in order to ensure you are giving your body all the iron it needs. You know I love probiotics – they are just foundational for so much of our health. Again they have a role to play in Anemia too – see below. So to boost you probiotic intake you can take a therapeutic supplement (the one below is what I use) make sauerkraut and kefir and eat them with every meal. You could also reduce how much sugar/sweet things you eat as sugars hinder the growth of good healthy bacteria and promotes pathogenic bacteria to grow and infest. 3.Be hospitable to B Vitamin. Vitamin B , specially vitamin b12 is needed for the production of red blood cells. So for some of you you may just not be eating enough iron an that has caused a deficiency but for some of you your bodies may have reduced the amount of red blood cells it making. Meaning if you were to take loads of iron rich food there would be no where for it to go (in a way) and there would be are less carrier of oxygen to all the organ around your body. Vitamin B 12 is synthesised in the ileum (small intestine) and in order for it to be produced there must be cobalt (provided by Vitamin B12 rich foods) and a healthy amount of intestinal bacteria. Are you seeing the connection? Vitamin B12 is needed to make red blood cells – vitamin B12 is synthesised in the intestine when there is healthy probiotic bacteria present – so unhealthy gut flora/bacteria means no vitamin b12 and a reduction of the red blood cell production. Vitamin B12 deficiency has been linked to anaemia as well as other disorder like ME and other fatigued based conditions. So ensure that you are getting high level of probiotics in your diet, taking a quality Vitamin B complex but more importantly making sure you are doing things to heal your gut and making your body and digestive system a hospitable place for Vitamin B synthesis. If you want to read more in depth about this click here for an interesting article (I don’t agree with it all) by another nutrition expert. This is a cheap and easy way to get more iron and b vitamins into your diet as blackstrap molasses contains 7mg in 2 tbsp. So why not us it instead of honey on your yogurt or just eat a tbsp a day along with your leafy green and animal products. It taste great in cake, crumbles and smoothies. 5.Be best friends with Vitamin C.
Vitamin C means you absorb more iron during digestion. Natural ferrous iron is absorbed quicker and at a higher rate than the ferric form of iron and when there is vitamin C present in the gut and during digestion it converts any of the poorly absorbed ferric iron into the for effectively absorb ferrous iron. To many ferret sounding words?Basically make sure you take a good quality vitamin C supplement with every meal if you anaemia is severe or just ensure you have a plate full of vitamin C filled vegetable like carrots, broccoli etc , or squeeze lemon juice on everything you eat and drink water with lemon before every meal. It’s also worth noting that in older women (post menopausal) a build up of iron can cause inflammation and deplete the immune system.